With this product, you earn 91 loyalty points. Phyto-Touche Sun Glow Powder is a creamy powder that provides a unique sensory experience, for a tailor-made tan. Its ""wave"" design comprises two golden beige shades to tailor your tan however you like and a blush shade to add freshness and radiance. Its imperceptible texture melts onto the skin like a cream for a smoothing, perfectly even result, with no powdery effect. The skin is instantly more beautiful. Phyto-Touche blends perfectly with the skin and stays in place for flawless, natural and long-lasting make-up. Its indulgent, non-comedogenic formula, enriched with Camellia oil and Shea oil, protects the skin with repeated applications. Suitable for all skin types and complexions. 3 easy application methods, using a Blush Brush, for a natural tan all year round. Contouring Ibiza: 1. Start with the lightest shade all over the face. 2. Gradually build the tan by sculpting with the darker shade. 3. Finish with a touch of blush on the cheekbones. Highlight L.A 1. Start with the darkest shade all over the face. 2. Highlight the curved areas of the face with the lighter shade. 3. Finish with a touch of blush on the cheekbones. 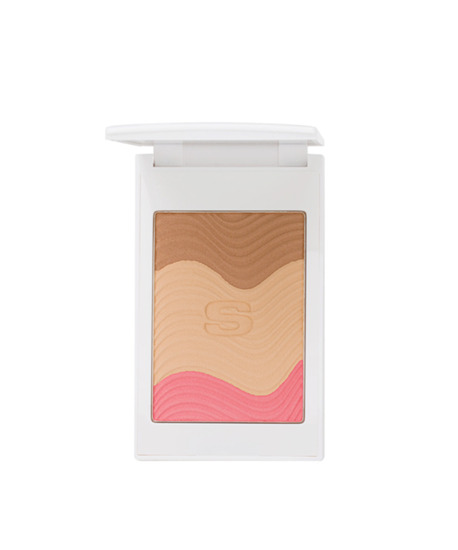 Sunkiss St Tropez Pick up 2 or 3 shades by sweeping the brush over the powder to create a customized tan. Finish with a touch of blush on the cheekbones.